Any Comodo certificate issued after January 2019 will reference Sectigo as the certificate authority, while any certificates issued prior to that will still reference Comodo. These are still the same company, and the only difference is the name. The following describes how to renew professionally-signed SSL certificates purchased through Sectigo. When should I renew my certificate? Make sure you renew the certificate BEFORE the expiration date. This ensures you do not lose any protection. Please note that even if you renew before the expiration date, you do not lose any time on your current certificate that you've already paid for. SSL certificates do not auto-renew by default. You must manually renew them within your panel. Certificate Authorities typically send expiration/renewal reminders to the admin address anywhere from 30 to 90 days before the certificate’s expiration date. This is to let you know that you MUST take action to renew the SSL certificate. DreamHost sends SSL certificate renewal notices to the primary contact address of the account 35 days before the expiration date of the certificate. You can then manually initiate the renewal process in your panel. There are two options to renew your Sectigo signed SSL certificate, which are described in the following sections. Renewing your certificate in your panel is basically the same procedure as purchasing a new professionally-signed SSL certificate. How do I purchase a professionally-signed SSL certificate? Renewing the certificate before its expiration date does not remove any time on your current certificate that you've already paid for. The new certificate will being to function once the current one expires. To renew a Sectigo certificate (before it's expired) by clicking the Renew button in the panel. This only appears within one month of the expiration date. Navigate to the SSL/TLS Certificates page. Click the Settings button to the right of your domain. Click the Renew Certificate Now button. Enter your personal and website information. You must fill in ALL of the fields (including the 'Organization name') in order to successfully proceed to the next step. If you don't have an organization name, then enter your first and last name. 'Street 2' and 'Street 3' are optional fields—you can leave those blank if your address does not include any of this info (such as an apt. #). This information is used to generate the Certificate Signing Request (CSR) that is used to generate your new professionally-signed SSL certificate. Click Proceed to Next Step when finished. On the next page, select one of your domain's emails from the dropdown. This must be an email on your domain. Make sure one of the emails listed in that dropdown has been created on your domain and you are able to receive mail with it. If it does not exist, create this email first before continuing. What is the DCV process? On the last page choose how you'd like to pay. Your options are either credit card or electronic check. When finished enter your information, click the Submit Payment Now button. Under your expired domain, click the Renew Certificate Now button. You can then proceed through the steps (in Option 2) above to enter your personal and credit card information and place the new order. What if my Sectigo SSL certificate does not complete the renewal process? There may be situations when your renewal does not complete, even though you renewed your Sectigo certificate in the panel. 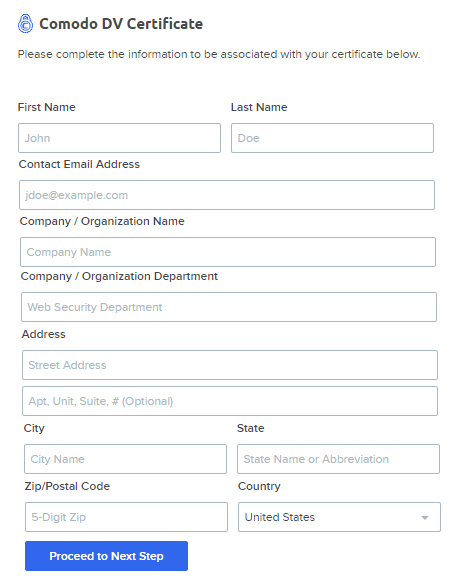 Typically this shows as 'Unknown' for the Expires value, which is usually due to a failure to respond to the request email sent to the Domain Control Validation (DCV) address you selected for this order. You must respond to the email that is sent in order to successfully complete the renewal of the certificate. Click the Settings button to the right of the domain. When the Settings page opens, click the Resend DCV button. Be sure to use a valid email address to send the order confirmation to. The DCV email is sent to the address you specified. Check your email, and then respond to the request. After the DCV email is confirmed, it can take up to an hour for the SSL certificate to become active. 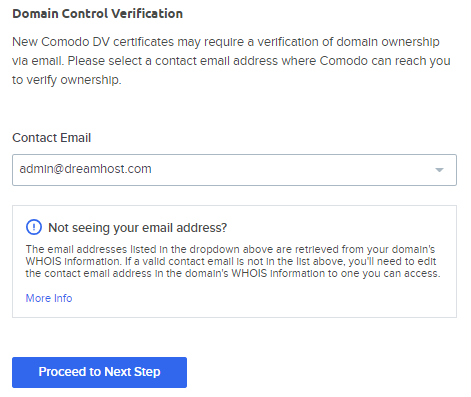 What do I need from DreamHost before purchasing a third-party SSL certificate? If you cannot find an available Certificate Signing Request in the panel for the domain/subdomain, please see the Generating or Regenerating a CSR article instructions on how to replace it. Article last updated April 11, 2019 16:49 PST.